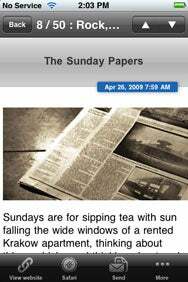 What makes the difference between a run-of-the-mill RSS reader and an extraordinary one? Having spent a fair amount of time using several RSS apps for the iPhone and iPod touch, I’ve come around to the view that it’s the little things. The interface, obviously, should be clean and easy to navigate. You should be able to sort your feeds without much hassle. You should be able to mark all stories as read with a tap of a button, and you should be able to flag a story for follow-up the same way. Every RSS reader worth its salt does those things. A handful of readers strive to move beyond the merely utilitarian to the genuinely innovative, with graphics and additional features. In the case of the three RSS readers reviewed here, however, the results are decidedly mixed. Headline News: iNews’ fancy screen features simulated front pages. But publication names are cut off, and the included graphics slow down the app. iNews (not to be confused with iNewz [ ]) has some interesting features, but one fatal and confusing flaw. The app from gdiplus lets you tap an arrow to read the next story, but won’t let you read a previous item. Once you’ve read it, the item goes straight into the trash. You can refer to the item again, but you need to exit what you’re reading, return to the home screen, tap the trash menu and hunt down the story. The app’s “fancy screen” feature is a more simplistic version of Newsstand’s ( ) design , with simulated front pages of each feed. The feature doesn’t add much—the publication names get cut off, and any graphics just slow down the app. The more feeds you have, the slower this is to load—and, indeed, the app crashed on me more than once. You can switch the feature off in preferences. 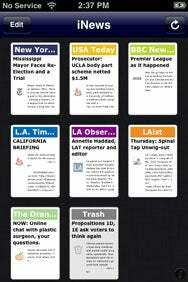 iNews does have some nice features that other readers would do well to emulate, such as hiding empty news sources, a tilt scroll option and the ability to read either the mobile text or original Web version of a story in a browser. 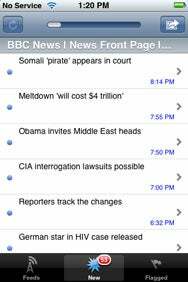 iNews lets you share stories by e-mail, to Twitter with or without comment, or to Instapaper ( ), which remains perhaps the easiest way to read articles on the iPhone and iPod touch. A word of caution, however—iNews prompts for your Instapaper name and password. If you happen to forget either, or enter one or both wrong, this feature will never work right unless you reinstall the app. That’s not so nice. As of this writing, iNews is on sale for $1—its App Store page indicates that it normally costs $4. A free version that’s limited to six feed sources is also available. A better RSS reader is Mayor Justin’s Manifesto. As with iNews, importing feeds from Google Reader or manually from a Web site or feed address is supremely easy. Simply type in your Google e-mail address and password, and the app takes care of the rest. The $2 app lets you browse by feed, new stories, or flagged stories under separate tabs. Browsing by new stories is least convenient if you have a lot of feeds, as I do. If, however, you have a handful of feeds, aggregate viewing is better than going feed by feed. For Your Offline Reading Pleasure: One of the best things about Manifesto is the ability to flag stories to read when you’re offline. Flagging articles is a simple matter of tapping the left margin of the story list or the flag icon at the top of the screen if you’re reading by story summary. To un-flag an item, simply tap the icon again. Manifesto also lets you flag all stories with a tap of a button. The great thing about Manifesto, however, is what happens once you’ve flagged a story: The app caches the stories you’ve flagged for offline reading. So although Manifesto works best with a Wi-Fi or 3G connection, you’ll still have plenty to read if you’ve flagged stories for later. Manifesto makes adding feeds easy. For the lazy among us, the app has an auto discovery feature that lets you enter a site’s URL, and then searches out the feed address. If that doesn’t work—and the feature is by no means perfect—then you can still enter feeds manually. The app also imports Google Readers feeds with just a tap, and lets you pick and choose which feeds you want. Picture This: ProRSS downloads photos, which you can view online or off. As with Manifesto, managing your feeds with Pro RSS is a snap. The app works like a charm with Google Reader, Newsgator, and Bloglines, and although I missed Manifesto’s auto discovery feature, I found it easy enough to import feeds manually. Pro RSS will download up to five feeds simultaneously. The app will completely cache a feed, along with images, for offline reading. And it does so without crashing. Pro RSS is also easy to customize in other ways. You can turn landscape viewing off and on and set the text size with a slider. The app also gives you the option of refreshing all of your feeds at start up and disabling the badge icon and cache features—though I’m not entirely certain why you would want to. The bottom line: Pro RSS and Manifesto are pleasing readers, while iNews struggles. All three applications are compatible with any iPhone or iPod touch running the iPhone 2.x software update.